On a mid-October afternoon in 1989, during a crowded rush hour commute, San Francisco began to shake. Quakes are common in "the city that waits to die" and many assumed this was just another tremor. Then buildings swayed. Plaster cracked. A section of the Bay Bridge collapsed and a freeway overpass crumpled. This looked like "The Big One." Writer Rebecca Solnit, raised in the Bay Area, knew the threat well, but she was surprised by the response -- hers, everyone's. Once disaster struck, "I was surprised to find that the person I was angry at no longer mattered. The anger had evaporated along with everything else abstract and remote, and I was thrown into an intensely absorbing present." 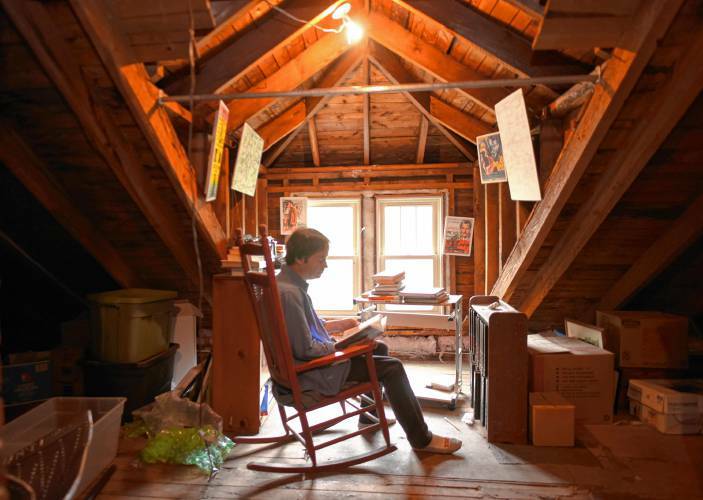 The quake that came to be called "The Pretty Big One" found Solnit just beginning her career. In the years since, she has written 17 books and hundreds of essays, but only recently has she emerged as hope's rising star. She has written about everything from photography to Apple Computers, from Alzheimer's to a history of walking, but her most loyal readers turn to her for hope. Hope, Solnit says, is never based on a careful assessment of facts. "To hope is to gamble," she wrote in Hope in the Dark. "It's to bet on the future, on your desires, on the possibility that an open heart and uncertainty is better than gloom and safety." Hope in the Dark, which she wrote to little acclaim in 2004, was reissued a decade later and, for reasons as simple as headline news, is now selling briskly. Solnit's glass half-full has earned her citations, a National Book Award, and 118,000 followers on Facebook. (In a recent Facebook post, she called herself "still your hope lady.") For book critic Dwight Garner, Solnit is "the kind of rugged, off-road public intellectual America doesn't produce often enough." Her writing is sometimes discursive, but always distinguished by her rejection of despair. Solnit is no mindless optimist, no rank denier, but she knows enough history to know that "change is rarely straightforward...Sometimes it's as complex as chaos theory and as slow as evolution." Hope in the Dark takes readers to scenes of a new world rising. From the fall of the Iron Curtain to the emergence of democracy in South America, Solnit follows the old adage -- "it is better to light a single candle than to curse the darkness." Though Solnit does not write about politics, her sympathies are clear. 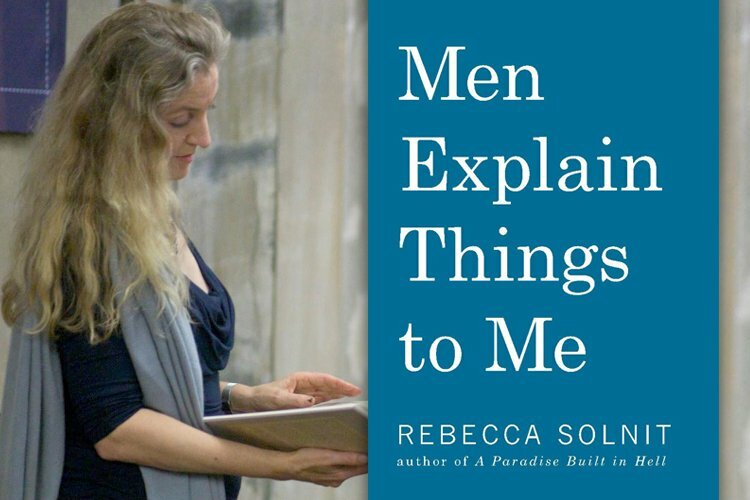 Her 2008 essay "Men Explain Things to Me" inspired the buzzword "mansplaining," the tendency of men -- "some men," she says with characteristic fairness -- to play the expert in conversations with women. However, Solnit seeks to bridge the American divide and is especially critical of perfectionists who refuse to acknowledge small victories. "Perfection is a stick with which to beat the possible," she writes. "Perfectionists can find fault with anything and no one has higher standards in this regard than leftists. . . This is Earth. It will never be heaven." 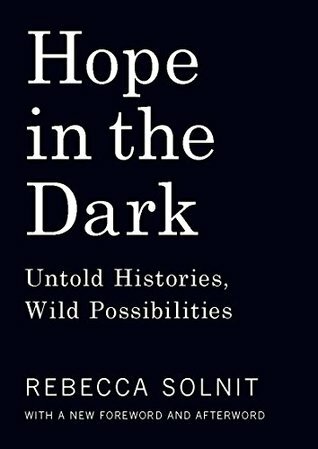 Solnit finds hope not just in movements but in people, particulary when the worst happens. In A Paradise Built In Hell, she studied "the extraordinary communities that arise in disaster." The 1906 San Francisco earthquake. 9/11. Hurricane Katrina. . . In calamity after calamity, she sees ordinary people doing extraordinary things. People opening soup kitchens in the rubble. People calmly evacuating the Twin Towers. People in small boats rescuing those stranded on rooftops in New Orleans. Disaster, as she noted when her own city shook, "is sometimes a door back into paradise, the paradise at least in which we are who we hope to be, do the work we desire, and are each our sister's and brother's keeper." So turn off the cable news blather. Temper your dark suspicions about human nature. Don't believe everything you read in that sinkhole of rumor and gossip -- social media. There is reason to hope. Reason to believe. There is, according to Hope's Rising Star, "a global restlessness, a pervasive shift of imagination and desire -- that has only just begun, and though it has achieved countless small-scale victories around the world, what its creativity and its power will achieve is yet unimaginable."